Laboratory of Vascular Anatomy. Second Course of Anatomy. Faculty of Medicine. Universidad de Buenos Aires, Argentina. SUMMARY: The cephalic vein shows a scarce description, especially in the deltopectoral triangle, and its ending in the axillary vein. 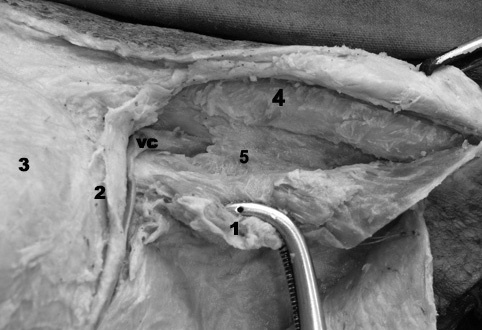 Some established considerations such as "superficial vein, located in the deltopectoral groove, accompanied by braches of the thoraco-acromial artery, which ends in the deltopectoral triangle in the shape of fan arch" should be reevaluated. Procedures difficulties in the la catheterization deserve for a more accurate description. A descriptive, prospective study is performed. The goal is to determine the anatomy of the cephalic vein in the deltopectoral triangle, with a special focus on the characteristics concerning its path and type of termination. 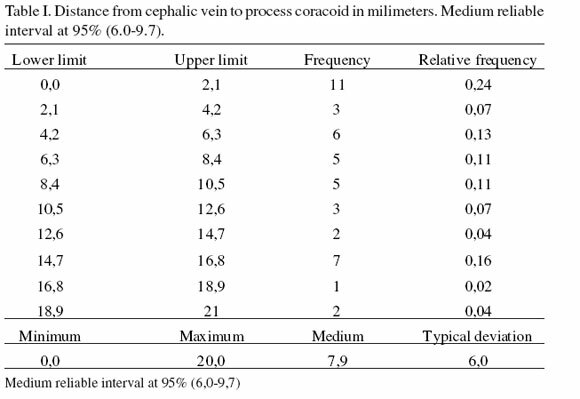 Findings show that the cephalic vein is deeply placed and has a different path than that of an arch (circumference segment on a level) with a retro pectoral path and an acceptable diameter, thus useful and safe in the catheterization processes. KEY WORDS: Cephalic vein; Deltopectoral triangle; Claviepectoral triangle; Catheterization; Venous access. RESUMEN: La vena cefálica ha sido poco descrita en el triángulo deltopectoral y su terminación en la vena axilar. Algunas consideraciones la señalan como "la vena superficial, situada en el surco deltopectoral, acompañada de ramas de la arteria toraco-acromial, que termina en el trígono deltopectoral en forma de arco de ventilador" por lo que debe ser reevaluado. Debido a las dificultades en los procedimientos de cateterización la vena cefálica merece una descripción más exacta. Se realizó un estudio descriptivo prospectivo con el objetivo de determinar la anatomía de la vena cefálica en el trígono deltopectoral, dando especial atención a sus trayecto y tipo de terminación. Los resultados demostraron que la vena cefálica está localizada profundamente en el surco deltopectoral, presenta un trayecto distinto a un arco (segmento de la circunferencia de un nivel) siendo este trayecto retropectoral y un diámetro aceptable, por lo tanto, útil y seguro para los procesos de cateterización. PALABRAS CLAVE: Vena cefálica; Triángulo deltopectoral; Trígono claviopectoral; Cateterización; Acceso venoso. Cephalic vein (CV) is classically described with its origin in the side corner of the dorsal venous network of the hand. From there the vein ascends towards the cubital fossa, where it receives one of the branches corresponding to the median antebraquial vein. In the arm, it is located side with the braquii biceps muscle, arriving finally at the shoulder occupying the deltopectoral groove (DG). On a second level, the pectoralis minor muscle (PmM) and the clavipectoral fascia (CF) are located and, after folding the MPMN; they continue in the direction of the clavicle repeating theaction with the muscle subclavius (MSC). On the level of the deltopectoral triangle, the CV goes through the clavipectoral fascia and connects to the branches of the thoracoacromial artery and joins the axillary vein (AV) (Bouchet & Cuillerette, 1979; Heitzman, 1885; O´Rahilly, 1986; Romanes, 1977; Testut & Jacob, 1982; Wanke et al., 1956; Williams & Warwick, 1992). Authors such as Chen et al. (2005), Grossman & Baim (1992) and Loukas et al. (2008) mention difficulties in finding the CV during surgery. These statements lead us to think there are details from an anatomical point of view, which are still to be clarified. Other authors point out the goodness of the CV as way of access (De Rosa et al., 1998; Le Saout et al., 1983; Langard et al., 1985; Nobili, 1976; Povoski, 2000; Viaggio et al., 1965), as they mention some details of its anatomy. This study has been made with an aim to describe the CV in the deltopectoral triangle and its termination in the AV, detailing its relationships, diameter, path and percentage of absence. The average diameter of the cephalic vein will be determined, as well as the average distance to the coracoid process (CP) and to the clavicle. The study will also determine the existence or absence of arch, the average length of the retro pectoral path and the existence or absence of satellite artery branches. Knowledge concerning the above mentioned details would minimize the complications during practice, in the eventual case of use of the CV during surgery. The design of this study was prospective and descriptive. Inclusion criteria were: Non dissected shoulder girdle of adult corpses in formaldehyde pertaining to the Second Course of Anatomy of the Faculty of Medicine of Universidad de Buenos Aires, Argentina. Fifthy shoulders were dissected (27 right and 23 left shoulders) from corpses of adults in formaldehyde to 5%. They were split into two series: 18 first dissections with the pectoralis major muscle (PMM) unreclined and the remaining 32 shoulders with muscle pectoralis major removed and reclined from their clavicular head. The cutaneous incision was made in a T shape with its branches corresponding to the clavicle and to the lateral edge of the PMM; flaps are reclined to the side and medium, uncovering the area of the deltopectoral triangle. VC diameters were measured on both series, as well as the clavicle and the sides of the triangle. Concerning the 32 cases where the PMM was reclined to the lower mid end, the length in the retropectoral path was determined in 28 opportunities and the termination of the VC in the VAX was observed. 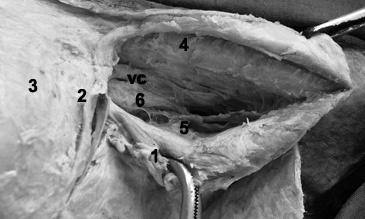 The path of the cephalic vein in relation to the coracoid process was split into a pre-coracoid and a post-coracoid segments. A blunt dissection of the CV was performed, palpating the CP, measuring the distance to the edge that separates them, measuring also the venous diameter in the lateral edge of the PMM, using a "Caliper Vernier" 125 x 0.02 mm caliber. The registry of each case was written down on a spreadsheet including the relevant variations, as well as a scheme of all the findings. Dissections were pictured using a 6 mega pixels digital camera. The statistical analysis was performed with XLSTAT 2008. When reclining the PMM, the CV was found covered by the deep fascia, portraying a false sensation of perforation (Fig. 1). As the fascia is lifted out, it is noticeable how the vein goes along the CF level, until reaching the AV or transits between the axillary and subclavian (Fig. 2). Fig. 1. Vena cephalica; 1. Pectoralis major muscle reclined; 2. Coracoideus processus; 3. Deltoideus muscle; 4. Clavicle; 5. Pectoral deep fascia. Fig. 2. Vena cephalica; 1. Pectoralis major muscle reclined; 2. Coracoideus processus covered by 3. Deltoideus muscle; 4. Clavicle; 5. Pectoral deep fascia; 6. Clavipectoralis fascia. CV is located in the medium next to the CP (vertex) at an average distance of 7.9 ± 6.0 mm (1SD) with a range from 0 to 20 mm (Table I). The average diameter of the CV, at the level of its meeting the lateral edge on the PMM was of 3.7 ± 1.30 mm (1SD) and a range of 1.0-7.5 mm (Table II). Regarding the relationship between the fibers of the deltoid muscle and the PMM, the findings show a fusion with absence of TDP in 4/50 of cases, in the remaining cases the separation at the clavicle level was on average of 19.8 mm, with a range of 0 to 50 mm. 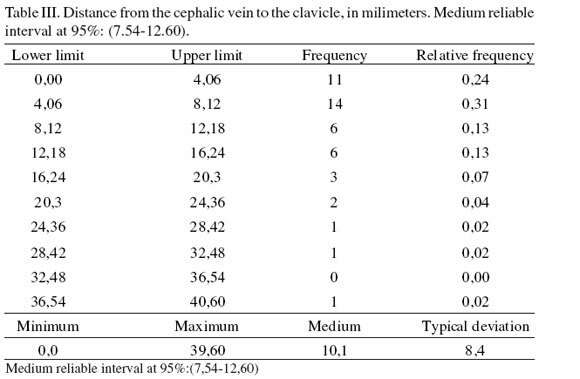 The distance from the VC to the clavicle, at the level of the lateral edge in the PMM showed an average result of 10.1 ± 8.4 mm; range 0 a 39.6 mm (Table III). The pre-coracoid segment in the CV can be absent in 4/50 of the cases. The post-coracoideous segment of the CV was found in all cases with curves on different levels, with angle variations from slight to deep curves. The first curve is found towards the clavicle on a parasagital level, describing an anteroposterior path. The CV then goes along in a medium position and almost parallel to the clavicle on an axial level. If finally moves back to an anteroposterior position on an axial level and goes through the CF (Fig. 3). Fig. 3. 1. Pectoralis major muscle; 2. Deltoideus muscle; 3. clavicle; 4. Pectoralis minor muscle; 5. Coracoideus processus. The dotted line outlines the path of the cephalic vein until its connection with the axillary vein. This segment showed the arch form only (segment of circumference on a level) en 3/32 (12%) of the cases. 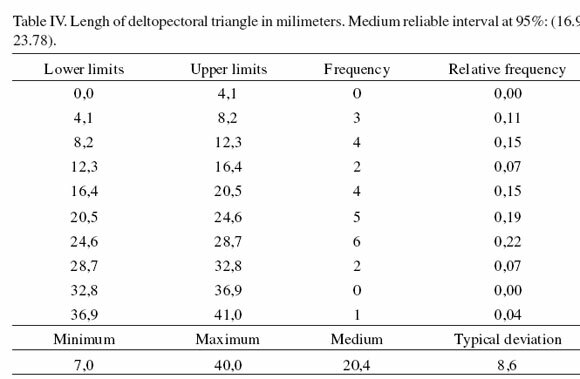 The final segment shows a retropectoral path with an average measure of 20.4 ± 8.6 mm (1SD), and a range from 7 to 40 mm (Table IV). This same segment showed in its beginning it constantly received 2 to 3 venous branches coming from the deltoid and clavicle sector. We have not found the supra- clavicular variation but in 1/32 (3.6%) of the cases, a cephalic vein attached to the lower side of the clavicle that joined the external jugular vein, and it was separated from the axillary vein by the subclavius muscle. The CV can not be considered to have a superficial condition in the deltopectoral triangle as it is located in a real muscle aponeurotical conduct, with its limits in the PMM and deltoideus muscle (DM) edges, covered by the superficial deltopectoral fascia, which can be, depending on the case, well conformed in some cases or else it can be slim or even interrupted by segments of fat tissue, resembling the situation of being placed in the subcutaneous celular. This detail states an important difference with other authors such us Loukas et al., who states that the CV is deep in 20% of the cases. Our dissections show that the CV is always deep, agreeing with Viaggio et al. and Nobili. This may provide explanation to the failures in surgery, where the CV is searched for in the superficial levels as stated by Grossman & Baim, Povoski and Chen et al. The CV does not show other satellite arteries during its path, as classically describes some authors (Testut & Jacob; O´Rahilly; Bouchet & Cuilleret; Williams & Warwick) it can be occasionally crossed by a slim branch, but the main trunk is situated deep in the middle, separated by a conjunctive tissue, as described by Langard et al.. It has been observed that there is a slim lymphatic vessel accompanying the CV. CV shows a retropectoral path on its way over the CF, which separates it from the PMM, and in none of the cases did we find it finish in the uncovered area of the trigonum deltoperctoral, but in the axillary-subclavia transition, at the level of the lower edge of the subclavius muscle. The post-coracoideous path shows curves somewhat deep on the sagital and horizontal levels and the presence o fan arch was found in 3 /32 cases. As to the diameter of the CV (Loukas et al. ), has the average result of 8 ± 1mm with a range of 1 to 12 mm; Le Saout et al. has values of 3,4 mm. In our research we found an average diameter of 3.7 ± 1.29 mm (1SD) and a range of 1-7.5 mm, the difference between the first and the second values may be due to a 5% retraction for formaldehyde. As to the absence of the CV, Loukas et al. report 5%; Le Saout et al. reports 19.7% and De Rosa et al. report 5.3%. In our researched dissections we found an absence of 8.2% (4/50). It is important to point out that the absence in our series has in all cases been that of the pre-coracoid segment of the vein. The post-coracoid segment has been found in 100% of our dissections, as a trunk draining the deltoid and clavicular branches. We have found on one single case that the CV arrives in the external jugular vein; this is to be kept into account when catheterizing in order to arrive at the cardiac cavities, as the catheter could accidentally slide towards proximal via the external jugular. 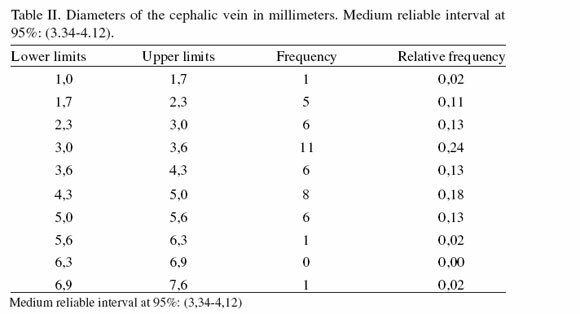 In 1/50 (2%) of the cases the cephalic vein was found close to the MD fibers and out of the "deltopectoral duct" y even in those cases the CV was found covered by the muscle aponeurosis. This fact is also mentioned by Langard et al. who found it on an 8% of the cases. Knowledge of the above mentioned details may help diminish the inconveniences when using the CV, as it is a good alternative in accessing veins. We wish to thank Dr. Gustavo Otegui for his constant stimulus and his unconditional support. Bouchet, A. & Cuilleret, J. Anatomía descriptiva, topográfica y funcional. Miembro superior. Buenos Aires, Médica Panamericana, 1979.